Yesterday I did my 2nd ever public presentation. 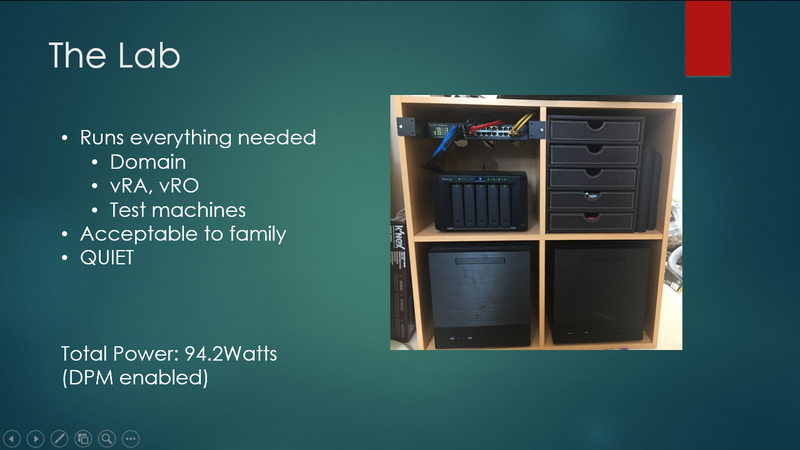 This time to the London VMUG community on choosing the perfect home lab and only using 100Watts of power int he process. 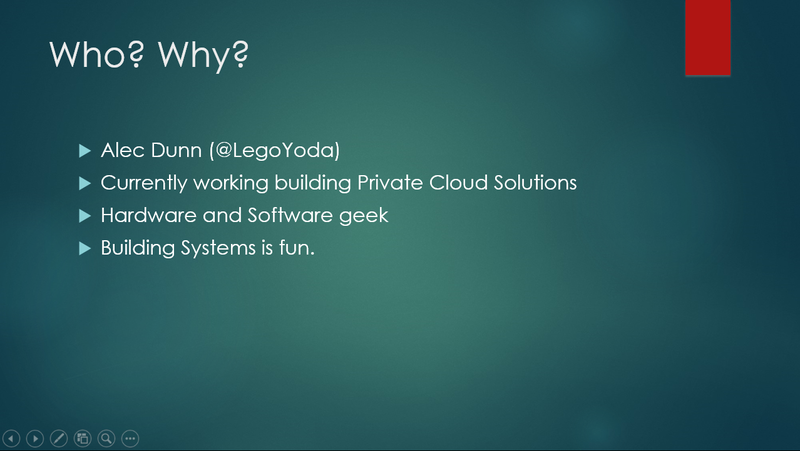 As some have asked for the slides I’m putting them here with context for a refresher and in-case you missed it. I messed up on the timing slightly on the day (damng timers!) so this contains a little more info that was presented. 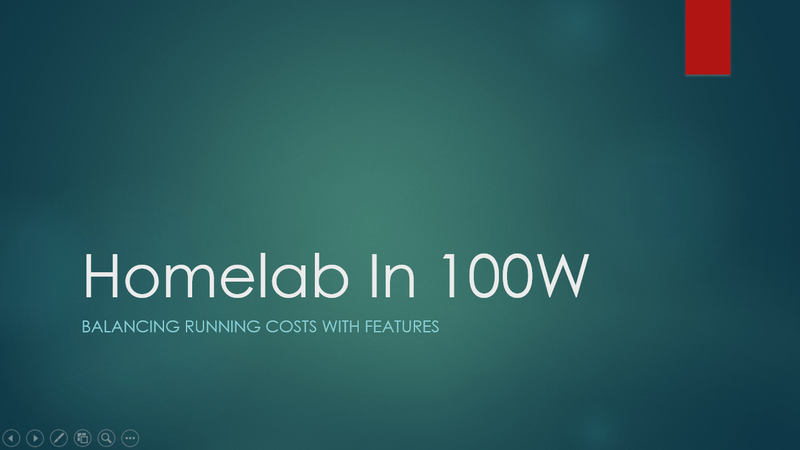 Yes, a capable home lab in under a hundred watts of power! It’s got to be able to run real applications and be useful too. Except, of course, the perfect home lab doesn’t exist! 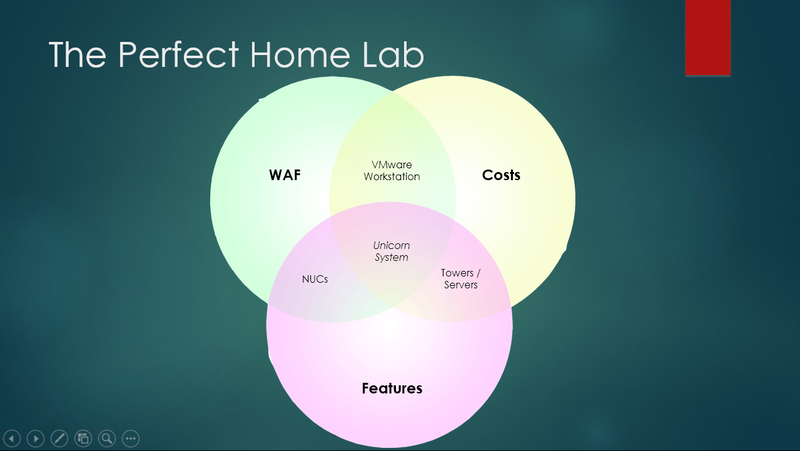 As I see it there are three main areas you need to focus on when designing a lab for a home environment. Costs, Features and WAF. WAF (WIfe Acceptability Factor) is a term created by Alex Galbraith of TEKHEAD fame. and it relates to how well your new shiny toy wioll go down with your wife / partner/ significant other. HP G3 ML580 server = poor WAF. Chromecast = Good WAF. You get the idea. 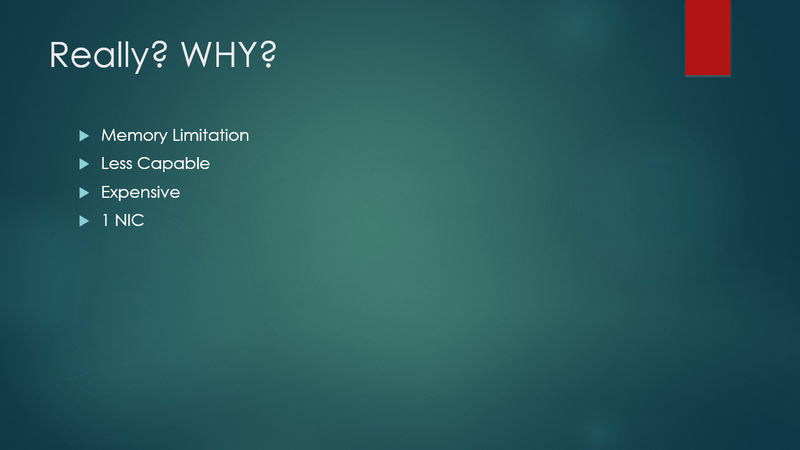 Costs obviously have to be considered along with the features you want to be able to use from the lab and run on it. 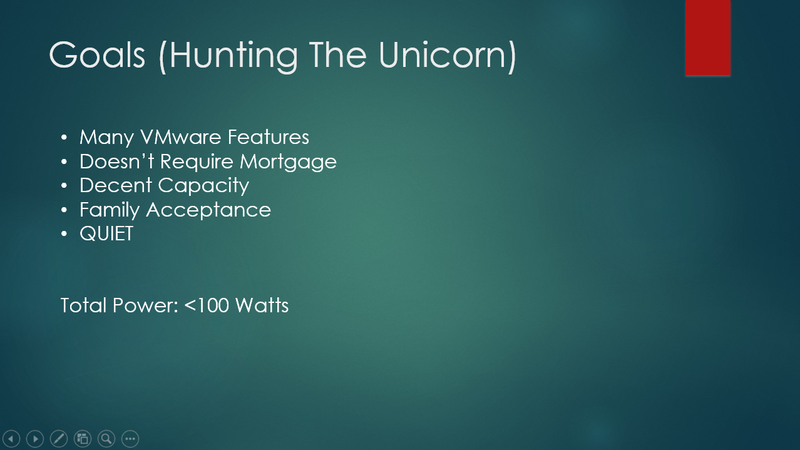 IF all of these three factors meet in the middle you get, what I’m calling, the unicorn system. A setup that doesn’t annoy the family, cost nothing yet does everything. But why not “go big”? Bigger is better right? 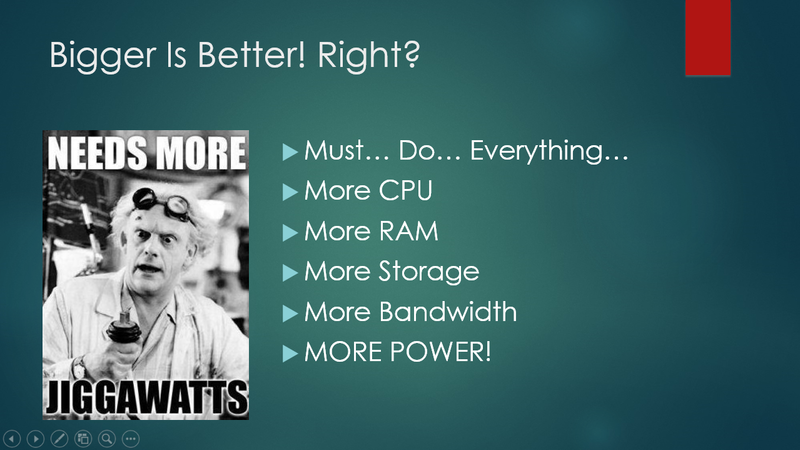 We all want the best CPU, the fastest RAM and everything that goes with it. But that means we ignore the hidden costs of running something all the time and you spend fortune up front. It’s all about balance. I couldn’t be so small i had to baby the VMs or keep all at the minimum on at any one time. It couldn;’t light up the room at night or annoy the family. 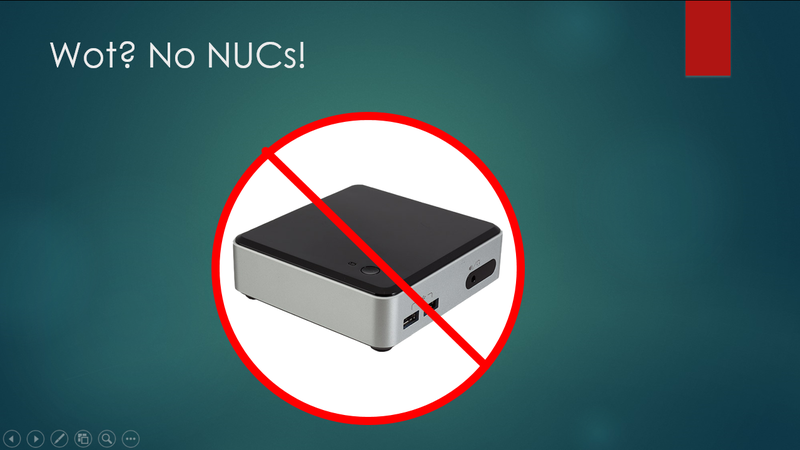 Normal most of the WAF and Power concerns would go away if you Used NUCs. I’m not using them. They still have a 16GB / unit memory limitation and that’s no good if you want to run vRA or vCO as well as anything else as they eat memory. They only have one NIC, they are less CPU capable and they are relatively expensive. 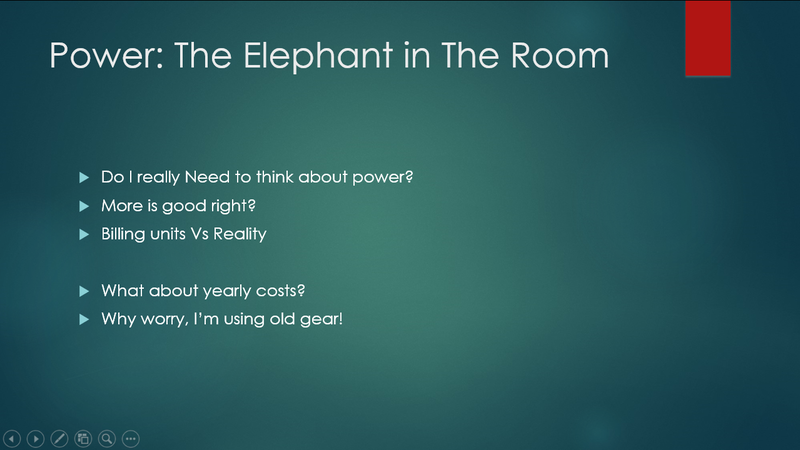 So why100Watts and why am I focusing on Power? Simple, no one thinks about it and in this day and age it really matters. Usually we think about more is good. But when using more electricity your wallet will not thank you for it! Before I go any further. This is the result It runs what I need (A domain, vRA, vRO and test machines). About 14 running and operating in total before I hit the 32GB memory limitation of one host and the second powers on via VMware’s DPM (awesome feature). in this guise (one host in standby) we run at 94.2 Watts. So? is that any good? I dd a comparison with a colleague who had built a 1 host lab from reused parts and a few new disks. This was the result. 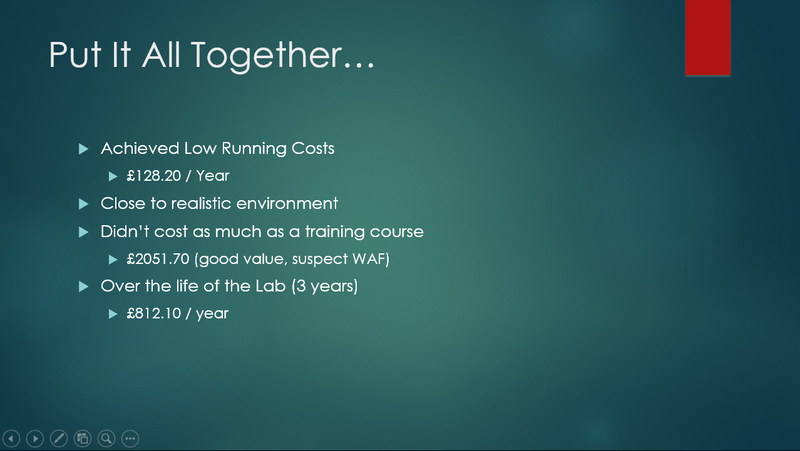 A huge £400+ saving on the cost of running the lab for a year! 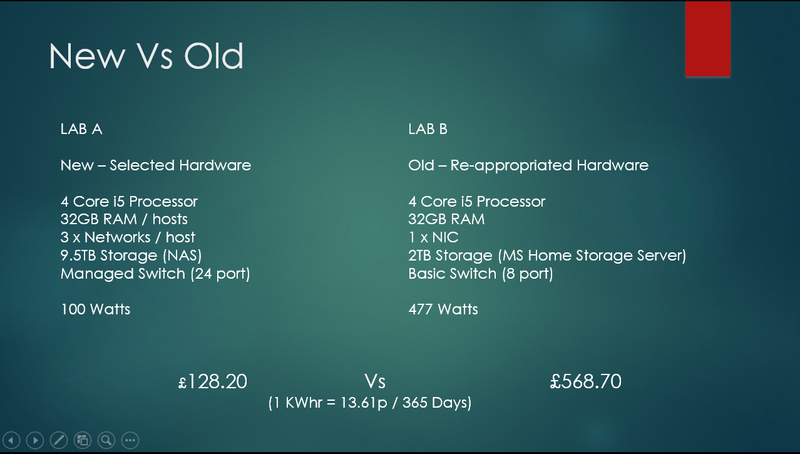 over the 3 year life of my built lab vs his cheaper (£300 ish) cobble that’s £1200+ of gear in electricity! All of which will be more capable than option B. So with that in mind here are the generic components I get to willful my goals. Networking was quite easy due to lack of choice. 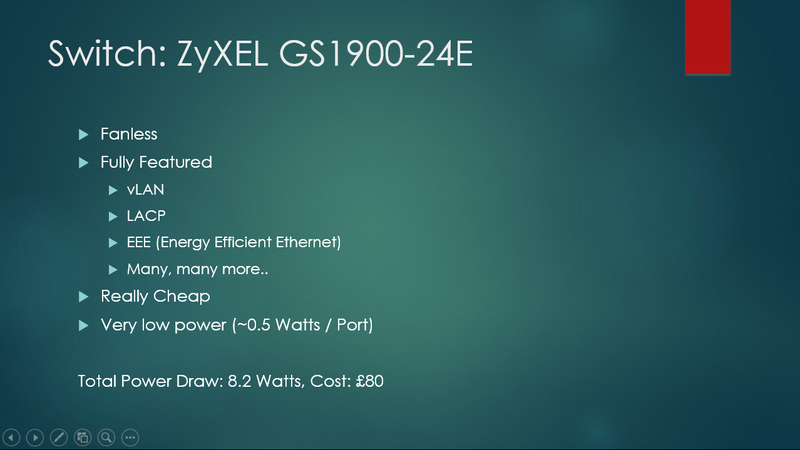 If, like me you;’re not a network guy and you want a fully managed, fully featured switch for home use that has the features you would like to play with (link agregation for example) and it’s fanless and, therefore, will fit in the home environment then this is THE option. Its also got a Web interface. Shame about the manual (rubbish). I’ll admit here that this was a bit of a splurge. 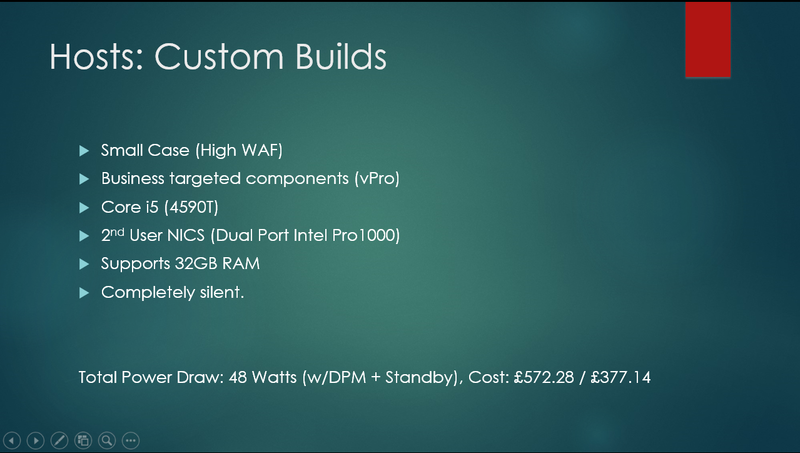 It’s by far the most expensive componant in the build but it does run cool, quiet, sips power and, at the same time, provides great performance, supports VMware Array integration APIs and have multiple network ports that support teaming and LACP. It runs the heart of the lab as well as the rest of the house with audio, video and picture streaming all supported. It essentially replaces my old media server. Hosts we all custom built in to a m-ATX case with low RPM fans and using “T” designation processors. These are Intels low power variants running at only 35Watts with a full feature set (but lower Ghz). 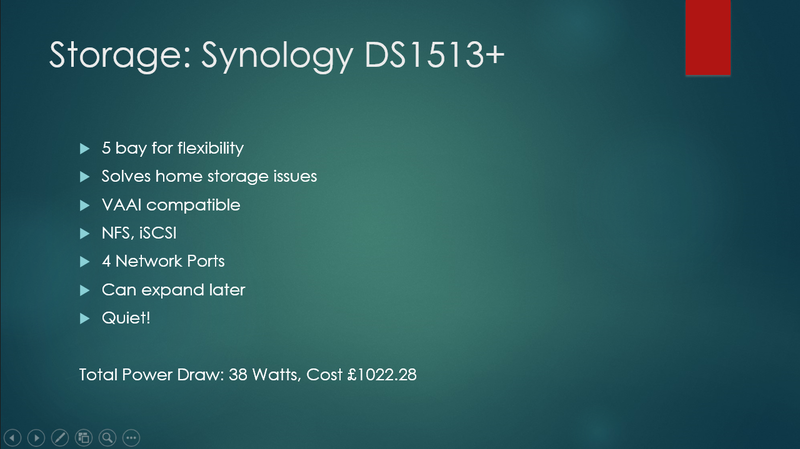 Building in a medium size case also allows for expandability and using PCIe cards for multi network ports and other cards you may want to use later (infiniband). Crucially, using m-ATX allous the use of motherboards that cheaply support 32GB ram per host. If you put all this together you get a balanced, powerful, featured lab that can do most things (granted, not VSAN in this configuration). It doesn’t cost the earth to run 24/7 if you want to, it’s close to a realistic “production” environment and it cost less than a VMWare training course. But, is it a Unicorn system? Of course not! They are unattainable! 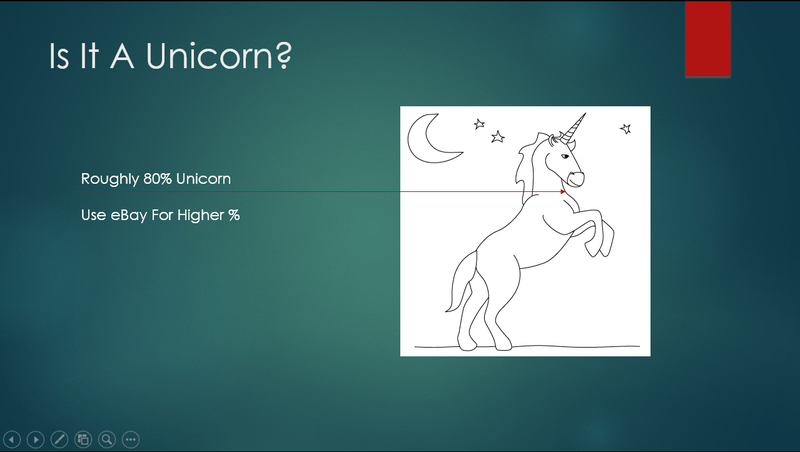 But, it’s about 80% unicorn. I built the second host using the SAME parts but i attempted to get them 2nd user from eBay is possible. This actually yielded a £195 saving over the cost of the 1st host but took a bit longer to build. You could save a lot of money on the whole build if you were prepared to wait for the elements to turn up on eBay. 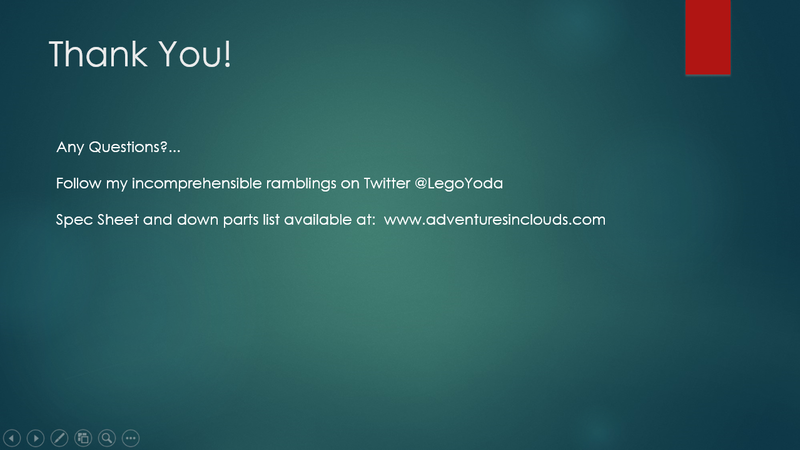 ← You May Have Noticed….